Please call owner Brian Baxter at 567-376-0197. Boat is in Columbus Grove, Ohio. 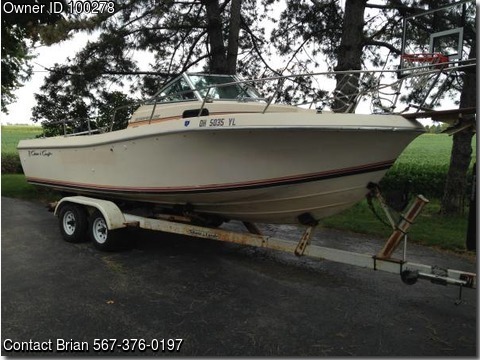 1985 Chris Craft Scorpion 216. Oil injected 2 stoke 200 horse Mercury (with power trim). 8ft. beam. Cuddy cabin with walk around bow. Humming Bird 768 GPS/sonar unit (4 years old) New marine radio. 2 new batteries. Trailor has new rims, tires, and lights on it. There is a couple small things that need fixed (horn,bilge pump, and the pumps to the 2 live wells). I refinished what little wood there is on it about 6 years ago. Only reason to sell is upgrade. I have used it only twice this year and everything ran fine.